9/23/2007Share this story on Facebook! I Am A Man: Black Masculinity in America, is a 60-minute, award-winning documentary video that intervies African-American men and women from more than 15 cities and towns across America. It strives to capture the thoughts and feelings of these people with some of Black America's most professive academics, authors and social critics to provide a current dialogue on black masculine identiy in American culture. 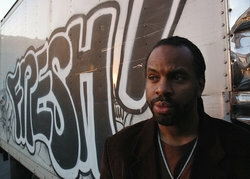 "I wanna make this very clear," Byron Hurt says in his documentary, Hip Hop: Beyond Beats and Rhymes, "I love hip hop." But just because Hurt loves hip hop, doesn't mean he can't question it. And that's just what he does. Hip Hop: Beyond Beats and Rhymes examines issues of masculinity, sexual aggression, and homophobia in today’s hip-hop culture. Ithaca College got the chance to meet Hurt, a former college quarterback for Northeastern University, when his film was screened on Monday, September 10 in Emerson Suites. The free screening was followed by an open discussion. Hurt says he produced and directed Hip Hop: Beyond Beats and Rhymes, which has received many awards, as a loving critique from a self-proclaimed "hip-hop head." The film's television premiere was last February on PBS, and has been named the best documentary at the San Francisco Black Film Festival. It was an official selection of many film festivals including Sundance. Hurt hopes the documentary can cause some people to look into the words they sing to and get people to take a harder look at the lyrics, and themselves. "Hip hop is trapped in a box," he says. "I long for a broader vision of manhood in the music I grew up with...the music that I love." Although Hurt's Ithaca College visit has passed, his documentary is on file and available for viewing at the Ithaca College Library. Or check him out at his Web site.